The National Legal Services Authority (NALSA) held a Commendation Ceremony at Vigyan Bhawan, Delhi on December 15, in collaboration with the Delhi State Legal Services Authority (DSLSA). The event was aimed at felicitating the best SLSA, DLSA, Panel Lawyer and Para Legal Volunteer (PLV) in the country. Mr. Ravi Shankar Prasad, Union Minister of Law & Justice and Electronics and Information Technology presided over as the Chief Guest for the programme. Other dignitaries included Supreme Court judge and Executive Chairman of NALSA Justice Madan B. Lokur, Supreme Court judge and Chairman of Supreme Court Legal Services Committee (SCLSC) Justice A.K. Sikri, Chief Justice of Delhi High Court and Patron-in-chief of DSLSA Justice Rajendra Menon, and Delhi High Court judge and Executive Chairman of DSLSA Justice S. Ravindra Bhatt. During the ceremony, the 3rd Module for the training of Legal Services Lawyers, which was prepared by NALSA under the guidance of former Delhi High Court judge Justice Manju Goel, was released. The module is expected to add value to the capacity building and skill development of panel lawyers. So far, around 980 training programmes for panel lawyers have been conducted by Legal Services Institutions based on these modules. Moreover, the project ‘Access to Justice and Remedies for People living in Far Flung Areas’ devised by NALSA was also launched. The project will be implemented on pilot basis at Leh and Kargil, with the objective of facilitating filing of petitions, appeals, etc. in the High Court. Awards were presented to the best PLV, Panel Lawyer, SLSA and DLSA of different states in both zonal as well as, in the national category. In the East Zone, the best PLV award was received by Mr. Mangla Dehri from Jharkhand, the best Panel Lawyer by Mr. Jayanta Narayan Chatterjee from West Bengal, best DLSA by Raipur (Chhattisgarh) and the best SLSA by Jharkhand. In the North East Zone, the best PLV award was won by Mr. Tingkai Konyak from Nagaland and Mr. Gulley Sumnyan from Arunachal Pradesh, best DLSA by Kokrajhar (Assam) and best SLSA by Nagaland. In the North Zone, the best PLV award was received by Ms. Bilquees Tantray from J&K and best DLSA by Gurugram (Haryana). The National award for the best Panel Lawyer was presented to Mr. Rajesh Kumar from Punjab, and the best SSLA to Haryana. In the South Zone, the best Panel Lawyer award was won by Ms. Sreeja Sasidhara from Kerela and the best SLSA went to Kerela. The national award for the best PLV and the DLSA went to Mr. B.V. Sagar from Andhra Pradesh and Pathanamthitta respectively. In the small States / UTs category, the award for the best PLV and Panel Lawyer was won by Ms. Sunita Devi and Mr. Gautam Bhardwajrespectively, both hailing from Chandigarh, the best DLSA was won by North East Delhi and the best SLSA was won by Delhi. In the West Zone, Mr. Nathabhai Nondhabhai Chavda from Gujarat won the award for the best PLV, Mr. Deepak Naik from MP won the award for the best Panel Lawyer, Alwar (Rajasthan) won the best DLSA and Rajasthan won the best SLSA awards. Mr. Ravi Shankar Prasad, while appreciating the efforts of the Legal Services Institutions and its workforce, emphasized upon the importance of access to justice, which is inclusive of all sections of the society, specially people living in the far flung areas. Justice Lokur apprised the gathering about the decision of NALSA to have impact assessment study of all legal services activities. He also emphasized on the need to have competent and professional workforce to render quality legal services. 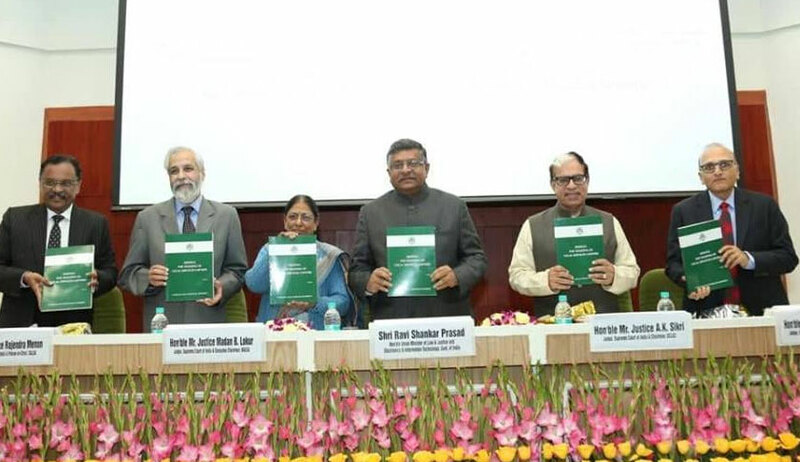 Justice Sikri threw light on the changing scenario of the legal services institutions, which he said have evolved from merely providing legal aid to the needy to facilitating ‘access to justice for all’. Justice Menon asserted that in order to bring law to the doorsteps of the common people, there must be a radical change in the thinking of the elite, intellectuals and the legal community in particular. Justice Bhatt said that access to justice, which is the motto of the legal services institutions, would be meaningless unless and until each and every individual can avail their rights under the judicial system.